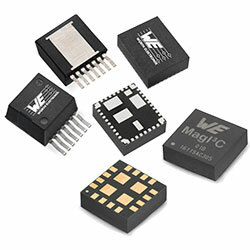 With the MagI3C VDRM, Würth Elektronik has introduced a new DC-DC voltage converter in this power module family in a TO263-7EP package. The input voltage range of the converter covers the range from 6V to 42V to provide conversion from the 9V, 12V or 24V industry bus. The product family is expanded with two new modules for 1A and 3A with an adjustable output voltage in the low range of 0.8V to 6V. The robust modules can be operated at an ambient temperature up to 105C. They are characterised by high efficiency up to 97%. The easy-to-solder TO263-7EP package measures 10.16mm x 13.77mm x 4.57mm.